Following up on the vintage menu we posted for Thanksgiving, here we have its Christmas cousin. Like the other, it is decorated with a beautiful drawing incorporating a star-topped Christmas tree under which are found gifts such as a drum, doll and—of course—a steam locomotive. Passengers started off with chilled apple cider or cranberry juice, enjoyed a relish tray with delicate radish rosettes and stuffed olives, and then chose between native Tom turkey with apple-pecan stuffing or baked sugar cured ham with raisin sauce and candied yams. 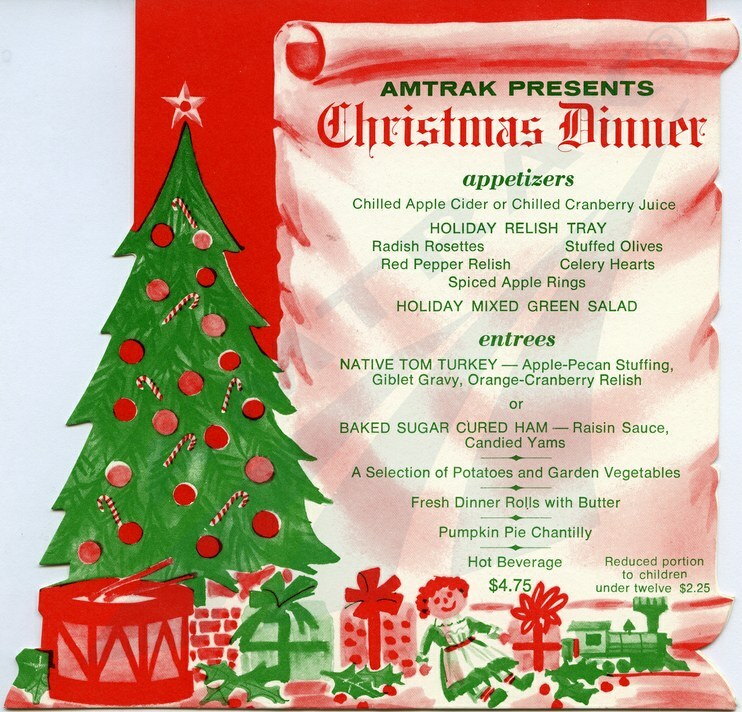 In the early 1970s, when this menu was printed, chefs on long-distance trains prepared meals in Heritage Fleet Dining cars, which had been purchased from the predecessor railroads when Amtrak took over the nation’s intercity passenger rail services in May 1971. By the start of the next decade, new bi-level Superliner cars built by Pullman Standard would be in use on many Western routes. Superliner kitchens are located on the bottom level of the car, making it easy for commissary employees to load food, beverages, linens and other necessary items on the train. Upstairs, tables for four occupy each end of the car while the center contains work space for the service attendants. A dumb waiter quickly moves plates between the kitchen and the dining room. 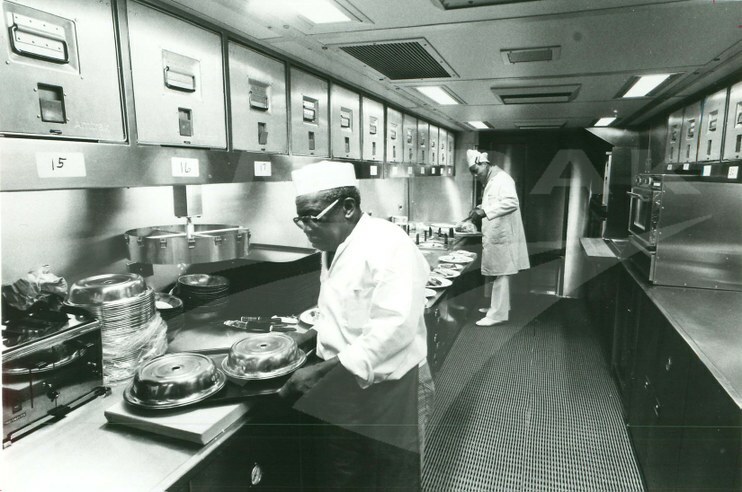 As seen in the photo below, the new Superliner equipment featured the latest technologies, including electric convection and microwave ovens, electric grill, toaster, coffee maker and warming table. The workspace was air-conditioned and had bright fluorescent lighting, making it more comfortable for the chef and his or her assistants. Today, Amtrak continues to offer special holiday meals aboard long-distance trains. Passengers traveling this Christmas may select a dinner of sliced turkey breast with stuffing and gravy; sides include three grain rice and a generous portion of cranberry sauce. To close the meal, there is gelato, sorbet or cake, as well as coffee or tea. Interested in how a chef and staff cook aboard an Amtrak long-distance train? Meet one of our chefs on the Amtrak Blog.